The main difference between OpenGL and OpenCL is that the OpenGL is used for graphics programming while the OpenCL is used for heterogeneous computing. Both OpenGL and OpenCL are managed by Khronos Group. OpenGL allows writing programs to perform graphics operations while OpenCL allows writing programs for heterogeneous systems that consist of multiple processors. Both of them are written using the C language. OpenGL is an API for rendering 2D and 3D vector graphics. It is one of the most popular APIs to write graphics programs. It is used in scientific visualization, video game designing, flight simulation, and, Computer Aided Design (CAD) in Mechanical Engineering, etc. OpenGL consists of already defined functions and the programmer can use them in their programs directly. We can create 2D (Triangle, Polygons, and Hexagons, etc.) and 3D objects (Cube, Sphere, and Torus, etc.) using OpenGL. It is also possible to perform scaling, translation, rotation, filling colors and shading and adding input devices interactions. Furthermore, we can perform blending, texture mapping, animations, adding atmospheric effects (fog, smoke etc. ), projections, etc. through OpenGL. A heterogeneous system is a system that uses more processors or cores to improve performance. The processors can be similar or different depending on the task. OpenCL is a framework that helps to write programs for heterogeneous systems. Therefore, the programmer can use OpenCL to write programs for systems with multiple CPUs, GPUs, Digital Signal Processors (DSP), Field Programmable Gate Arrays (FPGAs), etc. Moreover, it allows performing parallel computing using task and data-based parallelism. The kernel is a function that is executed on an OpenCL device. OpenCL defines an Application Programming Interface (API) to allow programs running on the host to launch kernels on computing devices and manage device memory. Furthermore, it provides a language similar to C to write programs. It has APIs for C, C++ and other languages and technologies such as Python, Java, Perl, and NET, etc. OpenGL is a cross-platform application programming interface (API) for rendering 2D and 3D vector graphics while OpenCL is a framework for writing programs that execute across heterogeneous platforms. Thus, this is the main difference between OpenGL and OpenCL. OpenGL stands for Open Graphics Library while OpenCL stands for Open Computing Language. 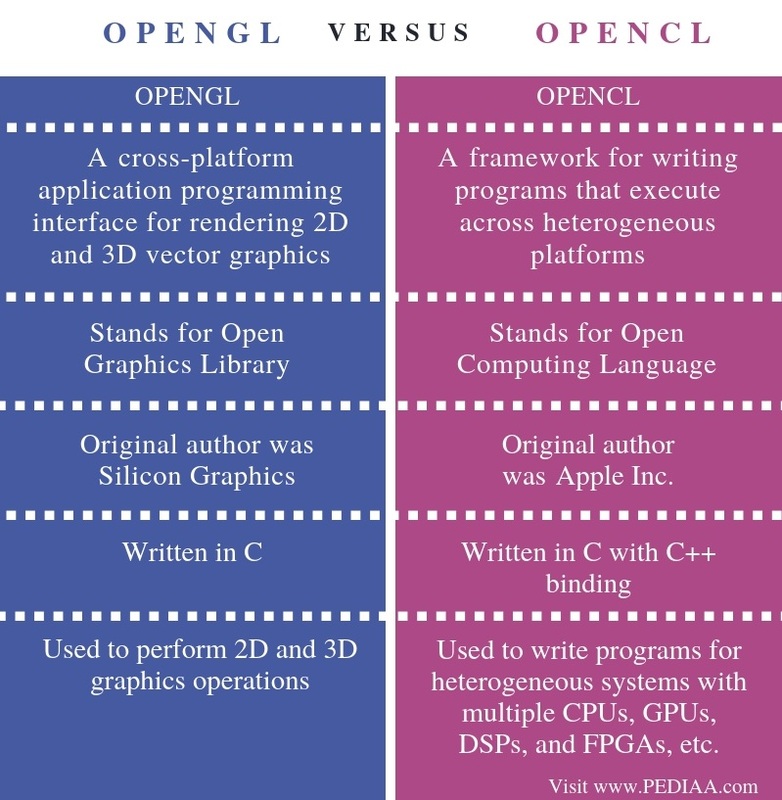 The original author of OpenGL was Silicon Graphics while the original author of OpenCL was Apple Inc.
Another difference between OpenGL and OpenCL is that OpenGL is written in C while OpenCL is written in C with C++ binding. Usage is a major difference between OpenGL and OpenCL. OpenGL is used to perform 2D and 3D graphics operations while OpenCL is used to write programs for heterogeneous systems with multiple CPUs, GPUs, DSPs, and FPGAs, etc. The main difference between OpenGL and OpenCL is that OpenGL is used for graphics programming while OpenCL is used for heterogeneous computing. OpenGL is used in video game designing, simulation, etc. OpenGL helps to increase the performance of the system and allows parallel computing. 1. “OpenGL.” Wikipedia, Wikimedia Foundation, 29 Jan. 2019, Available here. 2. 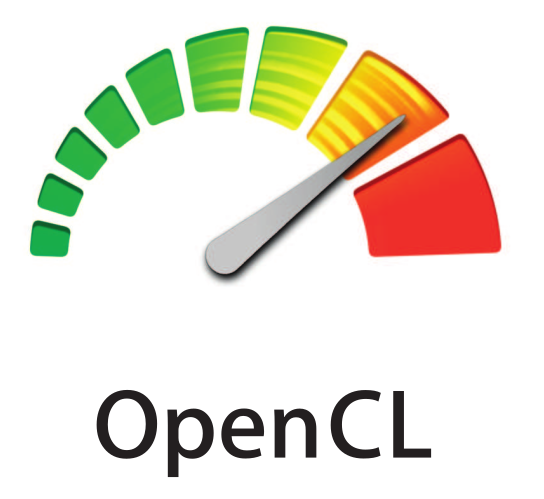 “OpenCL.” Wikipedia, Wikimedia Foundation, 13 Jan. 2019, Available here. 3. “Heterogeneous Computing.” Wikipedia, Wikimedia Foundation, 26 Nov. 2018, Available here.